Marcelo Bielsa and Leeds United could learn their fate over the 'Spygate' affair in the next week, Sky Sports News understands. The EFL board meets on Thursday for the first time since Bielsa admitted to sending a spy to watch opponents Derby County train at their Moor Farm complex on January 10. Sky Sports News understands any punishment, which would come under EFL Regulation 3.4, could become clearer over the next week. Regulation 3.4 states that "In all matters and transactions relating to The League each Club shall behave towards each other Club and The League with the utmost good faith." A number of Sky Bet Championship clubs made complaints to the EFL about Leeds' behaviour. 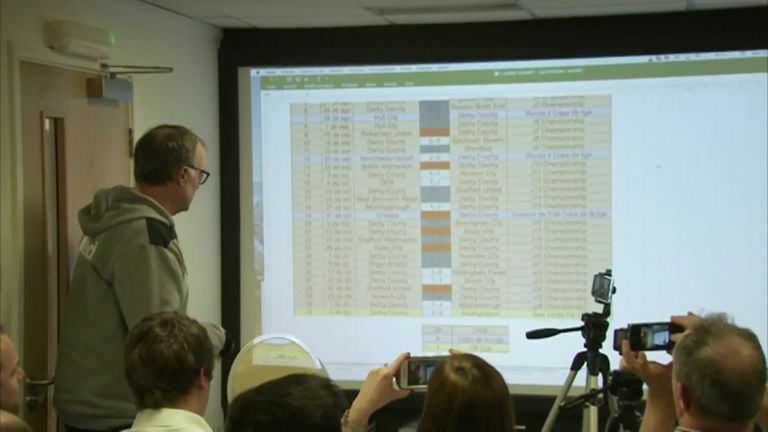 Leeds went on to beat Derby 2-0 on January 11 and, the following week, Bielsa would go on to explain in detail that the Sky Bet Championship club have watched sessions undertaken by all of their opponents since his arrival at the club over the summer. He invited the media to what turned into an hour-long PowerPoint presentation of how he prepares to face teams and the number of hours that go into looking at each opponent in minute detail. The EFL board is expected to be briefed on the latest findings of their three-week investigation and on the likelihood of Leeds and their manager facing charges - the Football Association is also looking into. Earlier this week, EFL chief executive Shaun Harvey told Sky Sports News that, after Thursday's board meeting, "the whole matter should move fairly swiftly from there".